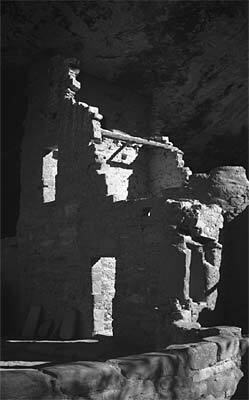 As part of our road trip we spent one day in the Mesa Verde National Park in Colorado. It was already late in October and we could as well have had rain and snow, but we were lucky and it was as nice an autumn day as one could wish for. I took this picture at Spruce Tree House which can be accessed by foot without a guided tour and therefore with enough time to drag out the big camera. Shot with my Kodak Medalist on Ilford Delta 100.